Vinita Jacinto told us to close our eyes and taste the sun, moon, stars and earth in the food she had lovingly prepared: saffron-kissed basmati rice and creamy lentils flavored with cumin and turmeric, topped with a dollop of pureed greens (including mustard, spinach, turnip and amaranth). I had met the chef, who was born in Mumbai, grew up in Calcutta and identifies as Punjabi, when we both worked at the California Culinary Academy. For 7 years, she taught sustainable, vegetarian, healthy cooking at CCA. I had worked there as an ASL interpreter. Later I interviewed her for two articles: where to sample breakfasts from different cultures and how to eat with your hands for a sensuous, mindful meal. This evening’s dinner, a springtime meal to celebrate Punjabi New Year, began with a table spread with a dozen delectable appetizers, incorporating the Six Ayurvedic Tastes. Vinita’s colorful platters tempted the eye as well as the palate. 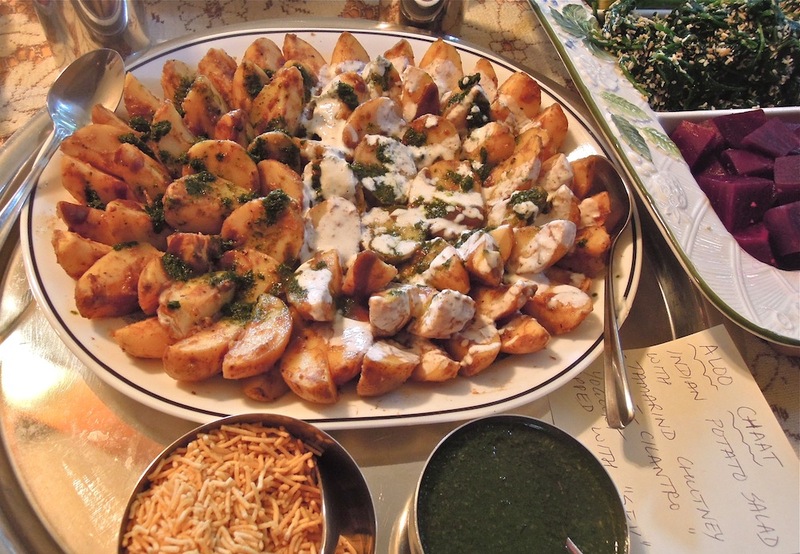 She thoughtfully provided labels, as the array of dishes was new to many guests and included: stuffed eggplant with ginger and garlic, black chickpea balls, and my favorite, spiced Indian potatoes, topped with yogurt and tamarind or cilantro-mint chutney and crunchy sev noodles. Vegetables included cooked asparagus, spinach and beets and raw radishes, jicama and cucumbers. 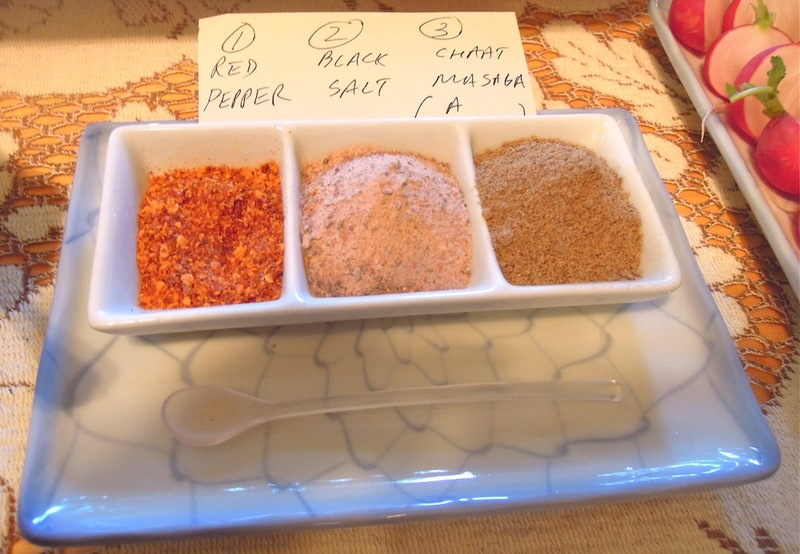 For a new gustatory experience, Vinita encouraged her guests to sprinkle the latter with “black salt”. She warned us that the black salt (which actually had a pinkish hue), would first give off a scent of sulfur “rather like an elephant’s fart.” I tried it and after a moment’s pause, discovered it did enrich the crunchy cukes with an earthy accent. 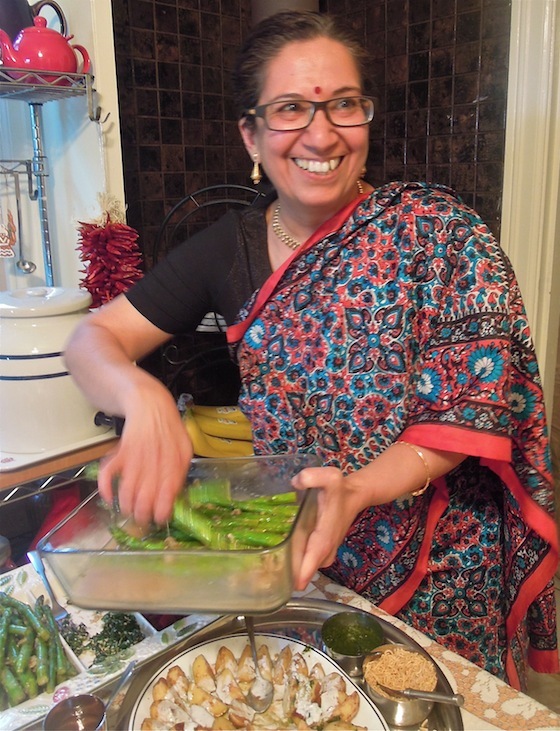 Vinita not only nourished her guests with the dishes she had carefully prepared, but with her culinary memories and wisdom. In the traditional Hindu kitchen, no one enters to cook until they’ve bathed and no shoes are ever worn in the kitchen. You also don’t taste what you are cooking, but intuitively can smell if something is missing. Through touch, the cook passes on her emotions, be it anger or love. My DNA transfers to you – that’s true farm to table cooking. Spices, they resonate with me. Dry them and toast them. And they impart their essence to you No matter what! They heal. They flavor. They whisper through our foods. Vinita’s newest endeavor is creating customized spice blends for couples, individuals or wedding parties. This entry was posted in Indian food and tagged 6 Ayurvedic tastes, CCA, The Spice Whisperer, Vinita Jacinto. Bookmark the permalink. OMG! Anna has done it again! She is so amazing! 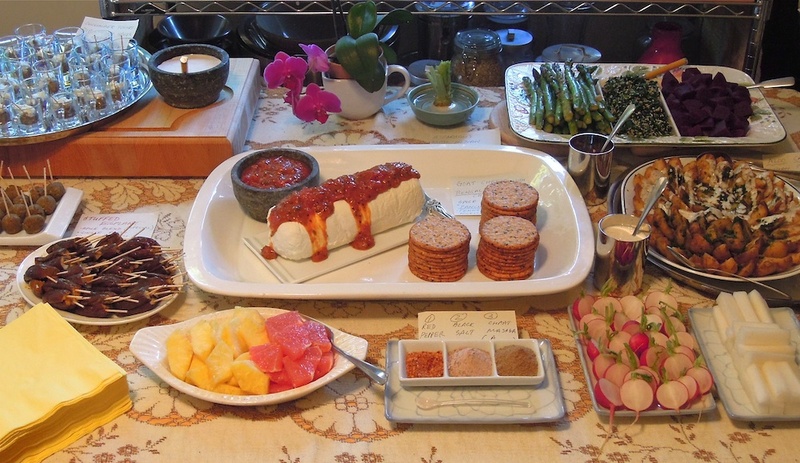 Her posts are the most exciting food reportage anywhere! Anna, thanks so much! Your writing has given the dinner another soul! Thanks. We are what we eat! We are what we think! So Mindfulness in Eating will make us More Efficient! God Bless you all for promoting this culture and Making Earth a better place! I totally agree. We are what we eat, think. Not many are aware of how emotions while cooking impact the people eating the food. Proud of Didi for this article.